0 Comment July 26, 2018 Like? Today we review how you can build an amazing mac-based live streaming system with Apple computers. We know that many of the creative community and apple users are thinking about adding live streaming and video production gear to their Mac-Based computer systems. So, we decided to break down some of the best “tried and true” ways to add multiple video cameras into your mac supported video streaming software such as: Wirecast, xSplit, OBS and MimoLive. We also discuss how the WebRTC and browser-based live streaming solutions such as Facebook and YouTube Live. Update to this video: We had to make to corrections in our presentation. 1. xSplit is not available for Mac OS. 2. OBS does not offer pan, tilt and zoom controls in the Mac OS. First of all let’s review the live streaming software that many people are using on their Mac Computers. The above software is listed in no particular order, but they all support the latest Mac OS software. OBS aka Open Broadcaster Software actually supports Mac, PC and Linux and it’s completely free. So this is a great piece of software to start with if you are not sure about all the features you need in the beginning of your video production process. Wirecast is a live streaming and video production software that supports both Mac and PC. Wirecast is what I call an “advanced” streaming software, which is a great upgrade to OBS that actually allows you to import your OBS scenes into Wirecast for an easy transition into the more powerful software. Next we have MimoLive which is a Mac only live streaming software designed specifically for Mac users. Since MimoLive is only available for the Mac OS you can expect a tailored experience that the Mac Community really loves. In fact, Boinx Software the creators of MimoLive even won an Apple Developer Design award for their interface. How do I get cameras into my Mac for live streaming? Capture Cards allow you to connect an HDMI or HD-SDI video input into your computer via USB 3.0. This allows you to select your camera source in your software just like a USB Webcam. Capture cards can be used in a ton of different ways and we always suggest keeping an HDMI capture card in your tool bag of live streaming gear. Capture cards are usually powered by the USB port on your computer and they come in a couple different versions. Almost all HDMI or HD-SDI capture cards are Mac compatible. You can choose between a simple HDMI to USB or HD-SDI to USB capture card, or purchase a capture card with a HDMI or HD-SDI loop through. A loop-through allows you to still use the HDMI signal while you are capturing the HDMI signal for use with USB. We use a HDMI to USB capture card with a loop-thru so that we can capture an HDMI signal and also still connect it to our HDMI television input. Capture cards are great because they allow you to bring in sources individually and allow you to switch between each camera. But you can also use a video switcher connected to a capture card to bring in multiple cameras that are switched upstream”. Blackmagic has great video switchers that can be connected to a USB frame grabber and captured to use with your video production software. Using an “up stream” video switcher is a great idea for many mac users because it takes all the video processing off the computer except for the single USB capture card that is easy for the computer to handle. This way you can do all the video switch and processing in your “upstream” video switcher like the Black Magic ATEM and send the output of that switcher to your computer via an HDMI to USB capture card. The picture above provided by MimoLive shows a popular application using the Blackmagic ATEM Video Switcher. The Blackmagic ATEM video switcher is being used to connect four professional SDI cameras. It then sends a video signal from the ATEM to a capture device which MimoLive has multiple options listed including: Ultrastudio Mini Recorder, UltraStudio 4K, Decklink Duo and the Intensity Shuttle. These capture devices all support Thunderbolt which is a popular connection to Mac computers. NDI is a new way to connect cameras directly over your LAN (Local Area Network) using a single Ethernet Cable. With a single Ethernet cable you can connect PTZOptics cameras to your network. Each camera can receive PoE (Power Over Ethernet). So one cable can provide power, camera control and video/audio. Mac Based Software that Supports the NewTek NDI includes: OBS, Wirecast and MimoLive. So pretty much all the major mac based live streaming solutions are on board with supporting this new IP based video production standard. If you are interested in using a Mac for video production and simplifying your video setup, this may be the solution for you. One of the final solutions that you may want to consider when setting up your mac based live streaming system is integrated camera controls. Yes, almost every live streaming software allows you to adjust the camera image settings, but only Wirecast and MimoLive have integrated PTZ camera support. This means that a single video production operators with Wirecast or MimoLive can also fill the shoes of multiple cameramen. Adding PTZ camera controls into your video production is a great way to add production quality into your setup. 4 Camera Live Streaming Systems from PTZOptics here. Live Streaming System Setup Tutorial here. How to setup a 24/7 live streaming system with an audience response system here. 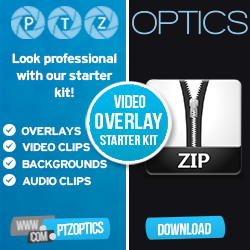 Introducing the PTZOptics Producer Kits here.